Threadlifts have been used to achieve a ‘mini-face’ or ‘body’ lift for many years.5 Materials that have been commonly used for threads include gold, poly-l-lactic acid, caprolactone, poly-propylene and polydioxanone (PDO) to name a few. Throughout their use, threads have achieved a high degree of patient satisfaction.6 PDO has been used in surgical procedures as an absorbable suture for many years, for example, they have been part of cataract surgical procedures since the 1980s.7 In the past few years, PDO has been used to make the threads for face and body to achieve lifting in these areas. PDO is used extensively in South Korea, where many of the threads are manufactured. The technique for thread insertion is relatively straightforward, provided suitably trained and experienced practitioners carry it out. It is important, prior to any treatment, that certain criteria are assessed to determine the patient’s suitability for PDO threads. Firstly, the patient’s medical history has to be checked. Auto-immune diseases, hepatitis B and C, HIV infection, pregnancy and breastfeeding, anti-caogulation therapy, existing infection and history of keloid formation are all contraindications for treatment.8 Care should be taken with patients who appear to be suffering from body dysmorphia. These patients sometimes demand results, which a non-surgical procedure like PDO threads cannot achieve. In my practice, I politely refuse to treat them as I know that it may be impossible to satisfy their requests. PDO threadlifting can give good results in the late 30s to 60s age group where a ‘finger’ test is positive, however it is not suitable for everyone. The test is positive if a finger can be used to get a satisfactory face or neck lift with a little finger skin elevation. The elevation, in my method, should need the finger to move 1-3cm only. In very lax skin or in very obese patients, a much greater finger elevation is needed – the finger may need to be elevated three or more centimetres. If the finger test is considered negative, then the patient would not be a suitable candidate for a PDO threadlift. It is also of critical importance that the limitations of what can be achieved are fully explained to the patient prior to the procedure. Pre-operative and post-operative photographs are essential not only to show what has been achieved, but also to point out any asymmetry that may be present. I had a recent case where one of my patients complained that I was the cause of a wrinkle line on her cheek, which extended from her cheek to the lower border of the mandible. She thought that a PDO maxillary threadlift had caused this line on her face. I was able to show her the pre-operative photographs and the complaint was amicably resolved with her offering me many apologies, as she had not registered the facial line previously. In fact, she subsequently went on to recommend me to two of her friends for whom I also did PDO thread lifts. The aesthetic concerns of the patient should be carefully noted and recorded and this must be followed by a thorough clinical examination. The examination should include noting the texture of the skin, and the degree of skin laxity as previously mentioned. Signs of skin infection including herpes type 1 should be looked for, as well as inflammation of the skin and mucous membranes of the mouth and eyes, as well as the presence of ulcers.9 The various facial vectors should be determined and the number and type of the threads used should be ascertained. The amount, type and points of local anaesthesia would also be determined and recorded at this stage. It is well established that PDO threads, correctly inserted in the tissues, result in a mechanical lift, which is maintained by the formation of collagen.10 In many cases, the use of monofilament, spiral or cog threads are all that is needed to achieve a satisfactory result. 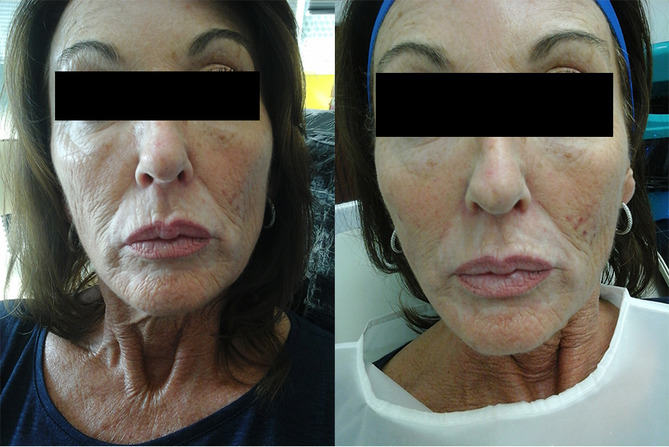 In the case of a mid-face and mandibular jowl lift, various techniques have been used. The 5-point thread facelift, which I believe gives excellent results, has been developed and described by Dr Jacques Otto.4,14 The 5-point, 8-point or even the 10-point thread facelift have also been used for a mid-face and mandibular jowl lift, but do not suit every case. The number of points that are used should not be necessarily fixed at 5-point, 8-point or 10-point, however. Instead, aesthetic practitioners should do a case-by-case assessment to determine the number of points of elevation. In cases of facial asymmetry these points may differ in position and number on each side of the face and neck. In other cases a more holistic approach is needed and PDO threads can be used with botulinum toxins, dermal fillers, lasers and radiofrequency. The development of new hybrid hyaluronic acid (HA) tissue modulators using patented heat technology, are well suited as adjunctive treatments to PDO threads because the unique high and low hyaluronic particles have been shown to be neocollagenic.16 This property would appear to be synergistic with PDO thread neocollagenesis. Hybrid HA modulators also have an effect of smoothing the superficial skin due to the presence of low molecular HA chains.16 This is a desired effect when using PDO threads, as skin folds can occur. This type of HA filler can be placed in the correct tissue plane by using the Bio Aesthetic Point (BAP) technique. 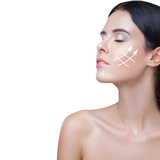 In clinical practice, the HA fillers and botulinum toxins are placed after the PDO threads are in situ. The use of dermal fillers and PDO threads together is not new, but I believe that the use of hybrid HA complexes is a new development and give better overall results. In my patients, post-operative skin folds have been reduced and the skin has appeared fresher and better hydrated even after one day. Care must be taken with thermogenic combination treatments such as laser, as PDO threads may denature with heat. 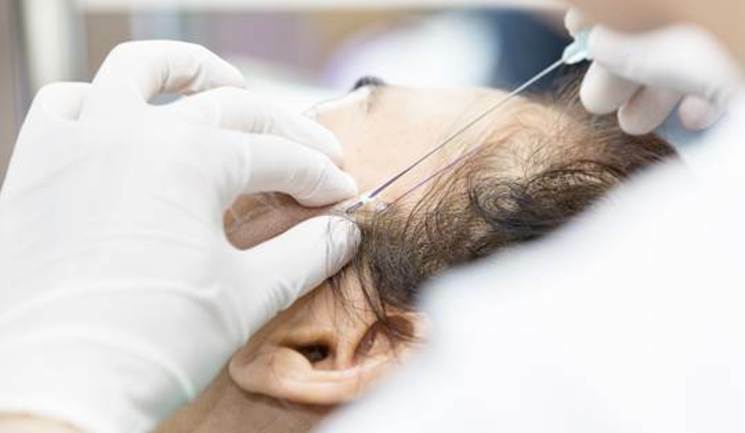 These types of treatments should therefore be done before PDO threads are inserted. Finding the correct plane can be a challenge, so I have developed my own technique to ensure PDO threads are correctly placed (Figure 1). The MASH technique (Mian’s Alternative Snooker Hold) is an easy method to reach the subcutaneous plane when placing threads and allows for immediate and on-demand local anaesthesia. After appropriate sterilisation and skin cleaning, the PDO thread is inserted into a 2ml syringe, which has been prefilled with local anaesthetic without vaso-constrictor. A ‘no touch’ technique is employed. An entry point is made and the syringe and PDO thread cannula combination is slowly inserted into the opening, ensuring that the syringe is touching the skin. This will achieve the correct 10-15 degree angulation, which will ensure the blunt thread cannula is in the correct plane (SMAS). Care should be taken to ensure the cannula does not touch the skin. This will not only result in a superficial thread placement, but may also give rise to tissue inflammation as a result of contamination of the cannula by the skin. The cannula is slowly advanced to its end-point. During advancement, the index finger of the free hand should be able to ‘feel’ the end of the cannula. The combination of syringe attached to the thread cannula should be treated like a snooker cue. At any time during the insertion, the attached syringe can deliver a little local anaesthetic where it is needed. 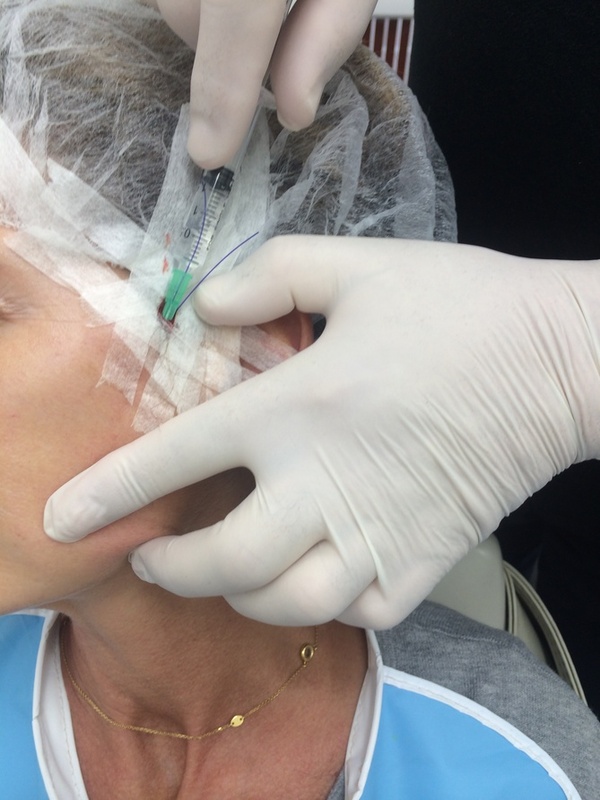 Only 0.01ml to 0.02ml is usually required and this technique reduces the need for large amounts of skin and nerve block anaesthesia of the face. The local anaesthetic syringe can be exchanged for a HA filler syringe and the HA filler placed using the retrograde, bolus or fanning technique, with the same cannula that was used to insert the PDO thread. Other materials such as skin boosters can be delivered in a similar way. At any point during the procedure, the patient can signal if they are in pain or discomfort. The cannula advance must be immediately stopped and a small amount of local anaesthesia should be injected while everything is held stable. After a few moments the snooker hold on the syringe-cannula combination can be resumed and the cannula slowly advanced to the end-point. As the syringe-cannula combination is turned two or three times to achieve ‘tissue grab’, the free hand is used to ‘massage’ the cannula of the tissues leaving the PDO thread in place. The technique is repeated as required for the placement other threads. When performed correctly, the MASH technique has several advantages and benefits (Figures 2 & 3). Following thread placement, the cog threads are held by artery forceps and twisted 10 to 15 times prior to cutting them close to the skin, thereby allowing them to retract into the tissues. The entry point should be sealed with a dressing. In regard to the length of the results, long-term studies are not available for the simple reason that PDO threads have not been used in medical aesthetics for a long time. However, short-term clinical studies have shown that the results of the PDO threadlifts were maintained, on the whole, for six months with a little loss of facial elasticity.5 In my experience of carrying out approximately 120 threadlifts, the average patient satisfaction time is approximately 12 months. I have found that my average patient satisfaction time was very short when I first started in 2013, where it was six months or less in some cases. However, now with more experience, better threads and improved thread-lift planning and techniques, results usually last 12, or sometimes up to 18 months. PDO threads are a safe and effective way to achieve tissue lifting in the face and body. They should be placed in the correct tissue plane and the MASH technique can achieve this. A holistic approach to patient management is also proposed, to ensure the patient receives optimal results. A tissue HA modulator can also give a better overall result when combined with PDO threads. This technique can also be employed for other treatments, such as the placement of fillers, platelet rich plasma or other products. Bry, Dominic; Hopkins, Claire; Roberts, David N A review of dermal fillers in plastic surgery Current opinion in Otolaryngology & Head & Neck Surgery August 2010-Vol 18-issue 4-p295-302. Suh, D.H, Jang, H.W, Lee, S.J. & Lee, W.S, ‘Outcomes of polydioxanone knotless thread lifting for facial rejuvenation,’ Dermatological Surgery 6(2015). Llorca, V, MD & Soyano, S, ‘Lifting effect with polydioxannone absorbable threads without anchors on face and neck,’ Unidad Antiaging Hospital de Levante Benidorm (2006). Shimizu, Y & Terase, K ‘Thread Lift with absorbale monofilament threads,’ Journal of Japan: Society of Aesthetic and Plastic Surgery, 1(2013). Langevin H et al, ‘Subcutaneous Tissiue Fibroblast Cytoskeletal Remodeling Induced by Acupuncture: Evidence for a Mechanotransduction-Based Mechanism,’ Journal of Cell Physiology (2006) pp.767-764. Otto, J, ‘PDO Threads for skin rejuvenation and facial tissue anti-ptosis,’ Body Language (2015). D’Agostino et al, ‘Invitro analysis of the effects of wound healing of high and low molecular weight chains of hyaluron and their hybrid complexes,’ BMC Cell Biology (2015). Yau, B, Lang, C, Sawhney, R, ‘Mycobacterium Abscess Post- Thread Facial Rejuvenation Procedure,’ ePlasty 15(2015). Calva D, Chopra KK, Sosin M, De La Cruz C, Bojovic B, Rodriguez ED, Manson PN, Christy MR, ‘Manson’s Point’ A facial landmark to identify the facial artery. Journ Plast Reconstr Aesthet Surg 68(9) (2015), pp.1221. Great article. I love de Mash techique.!!! I will used it and share it.